Pokemon GO fever continues to ramp up, having launched across Europe after successful launches in North America and Australia last week. While Aussies clamour for Legendary Pokemon, US players of Pokemon GO are divided down battle lines. Decluttr, a US-based company with a focus on, well, de-cluttering your home, has crunched the analytics surrounding Pokemon GO and discovered which Pokemon is the most popular in each US state. 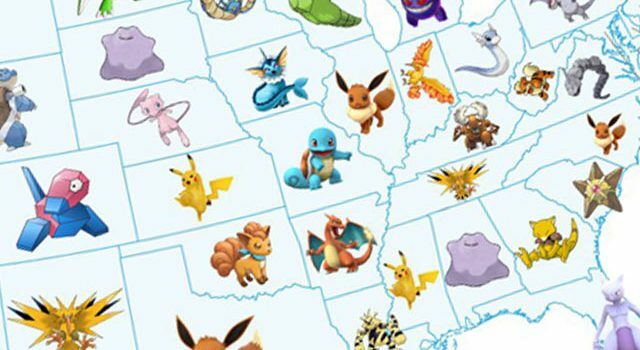 Pikachu is, unsurprisingly, the most popular overall, being highly sought-after in Arizona, Hawaii, Delaware, Mississippi, Rhode Island and Kansas. Ditto and Eevee are next up, being the most popular in four and five states, respectively.